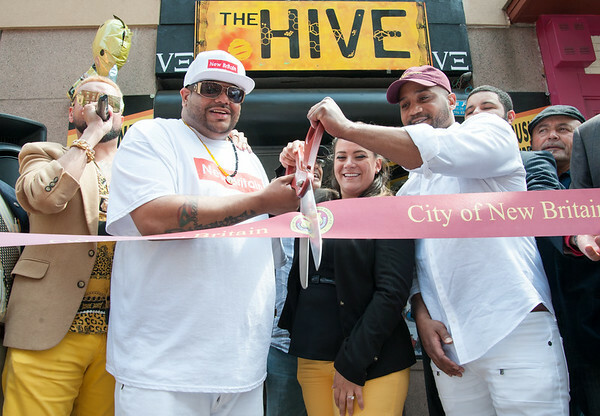 NEW BRITAIN – Downtown celebrated new business owners as Mayor Erin Stewart cut the ribbon at The Hive, a new clothing store, Thursday afternoon. Stewart said she’s happy to have a new business downtown, and added that she is proud of owners Steve Ayala and Damon King for wanting to have a business that represents the city. “You want to make this a success, I know you are going to do everything that you can to make this a success,” Stewart said, praising the co-owners for their hard work. Stevey Newnez, from Hot 97.3 Radio was also at the event to play music and support the owners and the new business. “This is like a welcome center ... it defines what New Britain really is,” Newnez said. Even though the store opened in December 2017, Ayala and King are beyond happy to have come to this point in their careers. The store is located at 42 W. Main St., and it offers customized airbrush and screen printed shirts. In addition, The Hive sells jewelry, sunglasses, electronics and a collection of New Britain branded clothing including New Britain “Experience the New” T-shirts. The theme of The Hive means a lot to Ayala and King. From the name to the overall look, the store is meant to identify with the city. The inside is painted yellow with black stripes to represent the New Britain Bees. Moreover, King said that yellow speaks for brightness and happiness, which is how he wants people to feel when they visit New Britain. “We wanted to start from the heart, from the ground up,” Ayala said. Ayala and King said they have been long time friends. Coincidentally, they had met years before in the same space where their store is today. The space used to be an airbrush store. The new business owners said they knew the location of the store would be the perfect spot to make good revenue. “We wanted to bring something new to this people, downtown,” King said. Ayala, who has been a business person for a long time, said that having a store is a reward and a big step. “I transitioned myself from selling things out of the trunk of my car, to really doing business,” he said. The Hive is open Monday through Saturday from 11:00 a.m. until 7:00 p.m. For more information about the store, the owners can be reached at thehive860@gmail.com. Posted in New Britain Herald, Business, New Britain on Monday, 11 June 2018 10:57. Updated: Monday, 11 June 2018 11:00.